It’s not easy being second best. Austin Texas has a 900 pound gorilla in just about every food category. That leaves the little monkeys left to vie for the scraps the Alpha bull doesn’t want or need. Fried catfish is a category wherein this holds true. Springhill Catfish [ 3 locations ] puts out the best plate in town. If Reggies were ever open he would hold the kingship but since he only fires up the fryers a few times a year, he’s not open for discussion. The discussion then leads us to Cherry Creek on Manchaca Road. 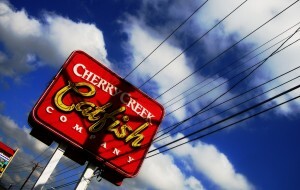 In business since 1997, it’s a south Austin stalwart and with good reason. They put out a good plate of fried fish. So why drive all the way to South Austin from the East side if it’s only second best? The moment we sit down we’re approached by a husky middle aged maitress [ male waitress ] .I silently wonder what happened to the bevy of young Crockett High School girls who used to man the tables but this goes away quickly. “Tomatoes” he finishes my sentence. “Best in town” we chorus. Corn meal dusted,fried in fresh fat and served with a respectable ranch these are the best fried green tomatoes in town. And plenty good enough to warrant the occasional trip down south. Dredged in corn meal seasoned simply with salt and fried quickly in clean oil, it’s fine-it won’t hearken you back to your favorite fish camp in Mississippi [ if you’re fortunate enough to have one ] but by Austin standards it is good. Service is amiable if not terribly on the ball.I wonder what sort of career our big-ol-good-ol-boy server was pursuing before he found himself slinging fried catfish. Something tells me it was not in the service industry. I grew up eating fried catfish. While Texas lacks the culture that makes catfish king in the South you can still get a respectable plate hereabouts namely at Cherry Creek Catfish Company;the second best fried catfish in town.